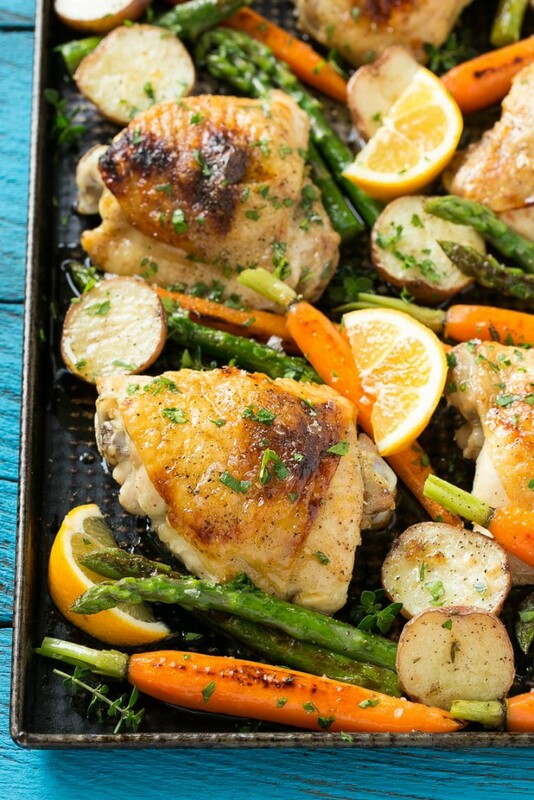 This recipe for lemon thyme chicken is a one pan meal of tender chicken thighs, new potatoes and spring vegetables, all seasoned with a sweet and savory butter and roasted to perfection. The perfect quick and easy dinner option that the whole family will love! As the weather continues to warm up here in California we’ve been spending more and more time outside. Our backyard is perfect for entertaining and we’ve been inviting family and friends over for dinner every weekend. As much as I love hosting dinner, I also love being able to spend time with my guests. 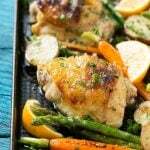 I often turn to one pan meals like this lemon thyme chicken with vegetables to make entertaining easier – everything bakes in the oven together which means you won’t be stuck in the kitchen for hours! How do you make lemon thyme chicken? This lemon thyme chicken is made with bone-in skin-on chicken thighs that have been seasoned with a sweet and savory butter. That same flavored butter is used to season the potatoes, carrots and asparagus. The butter contains garlic, lemon zest, fresh thyme and C&H® Honey Granules. If you can’t find the honey granules, you can substitute regular liquid honey instead. 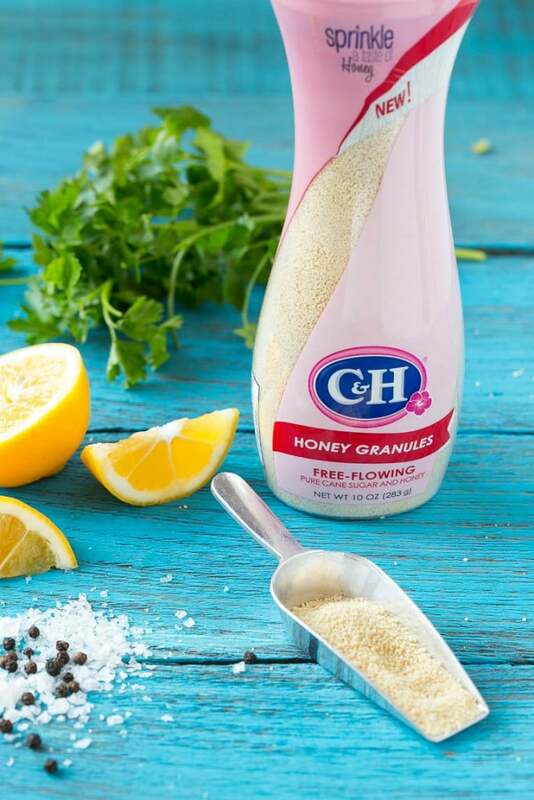 Have you ever tried C&H® Honey Granules before? It’s a free flowing mix of granulated pure cane sugar and honey. I love the flavor of honey, but I always end up with a sticky crystallized bottle in my pantry; this is a great way to get honey flavor without the mess. The granules come in a bottle with an easy to pour top and I’ve been putting them on almost everything! C&H® Honey Granules are great on top of oatmeal, sprinkled over buttered toast (think cinnamon toast but with honey instead! ), and you can use them in baking to substitute for all or part of traditional granulated sugar. 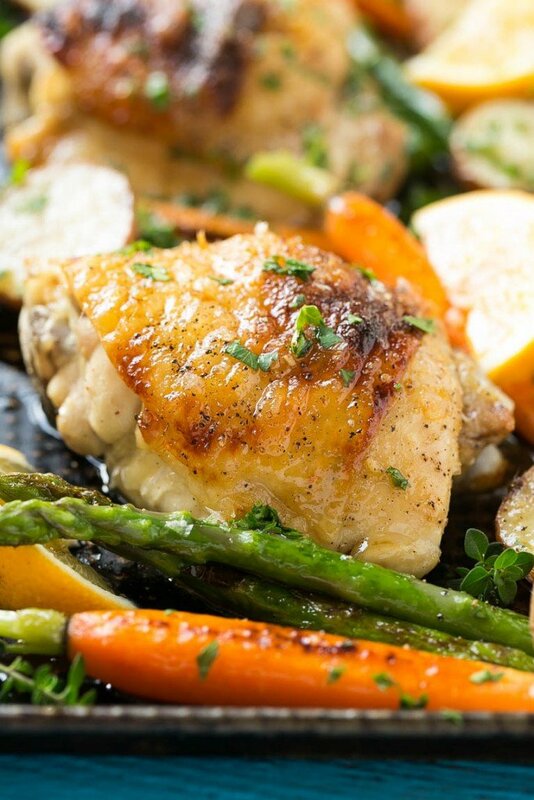 C&H® Honey Granules is also great in savory recipes like this lemon thyme chicken! You should definitely pick up a bottle so that you can sprinkle a taste of honey on all your favorite foods. C&H® Honey Granules is sold where I live, but if they don’t sell it in your area, look for Domino® Honey Granules, the sister brand of C&H®. The seasoned butter goes between the skin and the meat of the chicken thighs, you can use your fingers to loosen the skin and add the butter. The butter also gets drizzled all over the potatoes and carrots. If you can’t find these little spring carrots, it’s fine to use regular carrots that have been cut into smaller pieces. I add the asparagus during the last 10 minutes of the baking time so that they don’t get overcooked and mushy. The C&H® Honey Granules add a hint of sweetness that pairs well with the savory flavors. You can plate up the chicken with the vegetables, potatoes and a drizzle of the pan juices and you’ve got an elegant looking meal without a ton of effort. 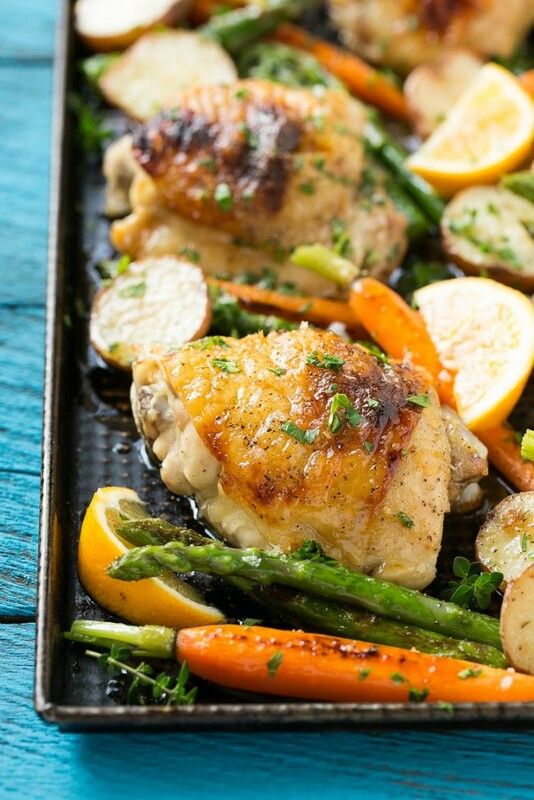 Whether you’re looking for the perfect meal for spring entertaining or simply searching for an easy weeknight dinner, this lemon thyme chicken with vegetables fits the bill. You truly can make an amazing meal without a lot of time or ingredients involved, especially when the ingredients have bold and complex flavors like garlic, herbs and C&H® Honey Granules. You can even create your own variations of this recipe by switching up the herbs and vegetables, the possibilities are endless! 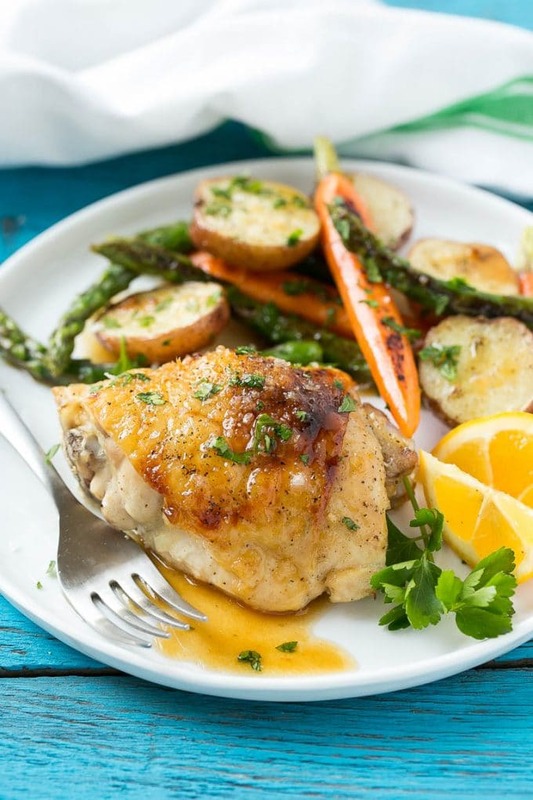 This recipe for lemon thyme chicken is a one pan meal of tender chicken thighs, new potatoes and spring vegetables, all seasoned with a sweet and savory butter and roasted to perfection. Preheat the oven to 400 degrees. Combine the butter, honey granules, thyme, lemon zest and garlic in a bowl; add salt and pepper to taste and mix until thoroughly combined. Line a sheet pan with foil and coat with cooking spray. Place the chicken thighs on the pan. Using your fingers, partially loosen the skin of the chicken thighs, creating a pocket between the skin and the meat. Take half of the butter mixture and divide it evenly among the chicken, placing approximately 2 teaspoons of the mixture under the skin of each chicken thigh. Season the tops of the chicken thighs evenly with salt and pepper. Place the potatoes and carrots on the pan around the chicken thighs. Microwave the remaining butter mixture for 10-20 seconds or until just melted and drizzle it over the vegetables. Bake for 30 minutes. Season the asparagus stalks with salt and pepper and then add the asparagus to the pan and bake for another 10-15 minutes or until chicken is cooked through. Serve immediately, garnish with parsley, coarse salt and/or lemon slices if desired. This post is sponsored by C&H sugar. This is a family favorite that goes on the dinner rotation! Always a crowd pleaser! Winner winner chicken dinner. Couldn’t find the honey granule so I used the regular with a dash of local honey and omitted the garlic. I hate cooked carrots and these carrots are out of this world delicious! I can’t find the honey granules where I live but I do have honey. How much honey should I use? I’m falling in love all over again. A perfect combination!!! This turned out really great and juicy. I couldn’t find the granules and didn’t have honey at home, so I used 1 and a half tsps of brown sugar. It was a great substitute. My bf and roommate thought it was very lemony, but I think it was just right. Whoa! Looks amazing. I want to make that! Can’t wait to try this yummy dish! What does garlic mean? Garlic powder? Minced fresh? Big differences in strength. Lemon and thyme are perfect complements to chicken! Thanks for sharing this recipe! This looks heavenly! I love the flavor combination and those roasted vegetables look so good, too! Perfect for my family dinner on Sunday. The powdered honey is an interesting item. I like the idea of always at hand honey as mine tends to crystallize. I like these 1 pan meals and will be trying those honey granules. Gorgeous photos, gorgeous meal! AMAZING glaze going on there from the lemon. Thanks for sharing this amazing recipe!!!! This is such a perfect meal for a weeknight dinner and it looks so delicious. I love roasted veggies! Beautiful delicious meal! What a treat – love great comfort food! I wouldn’t have thought to use the granules in this meal, but I think it’s really smart! I’m sure it helps the chicken brown so nicely! What a GORGEOUS one-sheet dinner! And the honey granules are a new thing I’ll have to try.